Here at Vegetarian for Life we wanted to celebrate Dignity Action Day – which takes place today, Friday 1 February. The day is all about upholding people’s right to dignity, particularly for those living in care. For the annual day led by Dignity In Care, we wanted to pledge our support to digni-tea with a cuppa. Many others are doing the same, with coffee mornings around the country to raise awareness of the event. 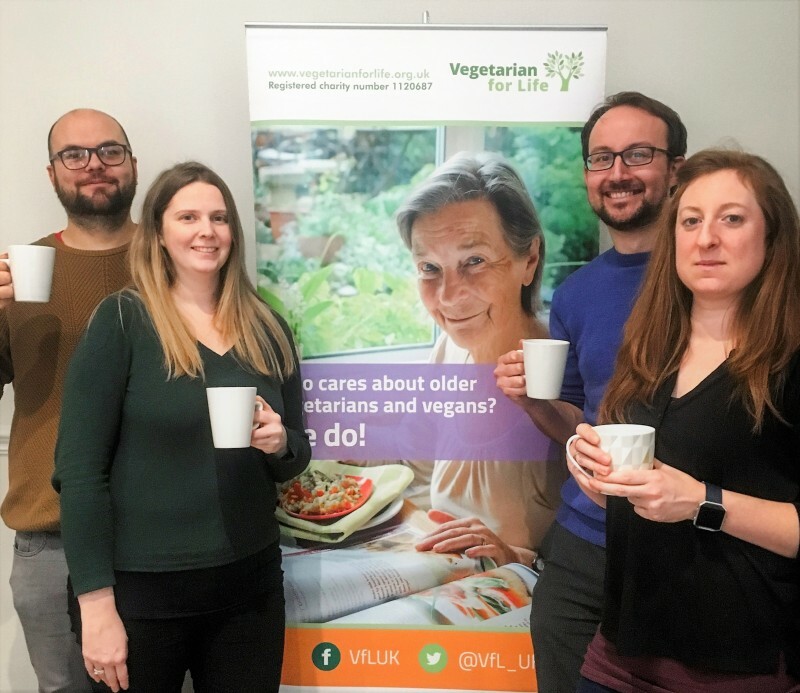 This was a tea break from the work that we do, which we spent considering ways that we can work to ensure older vegetarians and vegans have dignity throughout their lives, whether living independently or in care. We recently launched a Memory Care Pledge that can be taken by care homes. It is a way to help ensure that residents with capacity issues or cognitive losses will be offered a choice of meals, drinks and snacks that uphold their ethical beliefs. Many care homes have already signed up to the pledge. Amanda Woodvine, Chief Executive of the charity said: “Dignity in care is fundamental in the work we do. We are working with care providers across the UK to try and foster a better understanding of what it means for a person to be vegetarian or vegan. “This is why we introduced the Memory Care Pledge so that care homes can continue to work towards providing dignity in care for their residents. “For instance, if a person has been vegetarian or vegan for a number of years, or even decades, but sadly isn’t able to live independently any longer. “Food preferences will have been made clear when that person moved into care, but what happens further down the line if that person has issues with capacity, and no longer remembers they were vegetarian or vegan? Dame Joan Bakewell, Dignity in Care ambassador, said "Dignity Action Day highlights a more respectful way of behaving towards vulnerable people. The very old and the very young clearly need our respect, but it wouldn't do any harm to spread the dignity message across the population – then we can all benefit." Click here to find out more about the Vegetarian for Life Memory Care Pledge.